It is important that you order your keyguard to fit the case you intend to use it with. In this article you will find information about the cases that we currently can have keyguards made to fit. Please be sure to review the information on your respective keyguard before you order. We will have your keyguard made according to your instructions, and for the case you order. Once the keyguard has been cut it may not be possible to change it, with very few exceptions. If you fail to order the keyguard to fit the correct case it is very likely that it will not fit correctly and you will need to order the correct keyguard. Please keep in mind that the keyguards are not designed to attach to any particular case though some cases do offer attachment options that are available for an additional charge. For cases without an attachment option there are other possibilities to keep the keyguard in place such as suction cups and/or elastic straps which are availabel at additional charges. If you have other ideas or feedback on how best to attach keyguards to iPad cases, we're happy to listen. 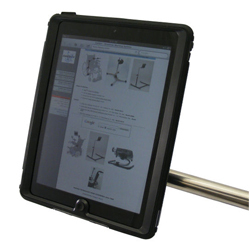 Keyguards that are made from 1/8" acrylic are best suited to the suction-cup attachment when NO CASE is being used with your iPad. If you require a deeper or thicker keyguard made from 1/4" thick acrylic and would like to use the Suction Cup attachment method, Communicate AT will install the cups for your prior to shipping. As the guards are thicker, the regular cups require special treatment which we are happy to do for you. It is to be noted that changing suction cups regularly between 1/4" guards may require replacement cups and/or damage your keyguard. Suction cups will not work for keyguards made to fit this case, with a few exceptions. You may use the optional Strap Attachment (additonal purchase), item LP-SA-337 with this case. The Otterbox Defender case for the iPad 1 is similiar to the Defender case for the iPad 2/3/4, shown to the right here. Keyguards for this case will not support suction cups. Strap Attachments, item LP-SA-337 (available as an optional additional purchase), is available for most keyguards made for this size case. The Otterbox Defender for the iPad 2, 1st generation(shown below), will support the attachment of suction cups (strap attachment may also be used with this case). A good indicator of which case you have is whether or not the camera lens is surrounded by the case, as shown by the arrow above, or open, as shown by the arrow below. If open, as below, the case is a 1st generation and the keyguard will be cut similiar to the image on the right. 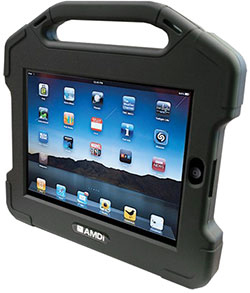 The AMDi iAdapter case is available for all versions of iPads. These keyguards do not allow for the attachment of suction cups. You can use the strap attachment, item LP-SA-337. These are all optional and require a separate purchase at the time of ordering your keyguard; keyguards can't be retrofitted with these options. The iAdapter Case Attachment option is made by cutting the keyguard and then cutting a second piece of acrylic slightly larger than the keyguard. The two are glued together to make one piece which, when viewed on it’s edge, will look like the image below. The left and right edge will rest on the iAdapter case with the keyguard resting on the iPad. You will need to use Velcro (not included) to keep the keyguard in place. For iAdapter 1 or iAdapter 2, this is the recommended option. The AMDi iAdapter Edge Attachment is cut from one piece of acrylic with a portion that has been cut away. The “edges” on either side will slide in between the case and the iPad. You will need to slightly loosen the screws on the back of the case then slip one side into the gap between the iPad and the iAdapter case. You will then GENTLY flex the keyguard and slide the other side into the gap. You may then thighten the screws. For iAadapter 3/4/4C, iAdapter 4 with Bluetooth, iAdapter 4C with Bluetooth, iAdapter Mini and iAdapter Mini with Bluetooth this is the recommended option. Keyguards for the Big Grips case will allow for the use of suction cups. You may also use the optional Strap Attachment (additonal purchase) with this case. Keyguards for the Griffin Survivor will not allow for the use of suction cups. You may use the optional Strap Attachment (additional purchase), LP-SA-337, with this case. NOTE: Some keyguards, such as ones made for LAMP Words for Life, Speak for Yourself, etc., will not allow for straps due to the number of openings required by the app. The Xgear 360 will allow for the use of suction cups. You may also use the optional Strap Attachment (additional purchase), LP-SA-337, with this case. The GoNow case will not allow for the use of suction cups. You may use the optional Strap Attachment (additional purchase), LP-SA-337, with this case. Suction cups will not work for keyguards made to fit this case, with a few exceptions. You may use the optional Strap Attachment (additional purchase), LP-SA-337 with this case. Keyguards for this case can use both Suction Cups option and also Strap Attachment (additional purchase), LP-SA-337. Both items are optional and available for an additional charge. Suction cups will not work for keyguards made to fit this case, with a few exceptions. You may use the optional Strap Attachment (additional purchase), LP-SA-337, with this case.